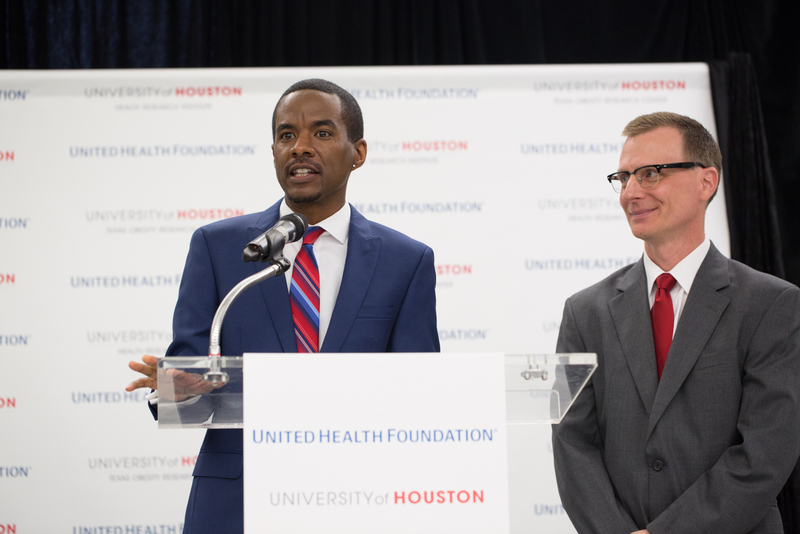 The three-year grant to professors Ezemenari Obasi (Left) and Dan O’Connor (Right), fellows at the UH HEALTH Research Institute, will focus on the Third Ward and the East End. The goal is to reach more than 5,000 Third Ward residents. Preston Allen, Wheeler Avenue Baptist Church, told the audience at a March 29 press conference that health and nutrition are critical in the development and revitalization of the Third Ward. 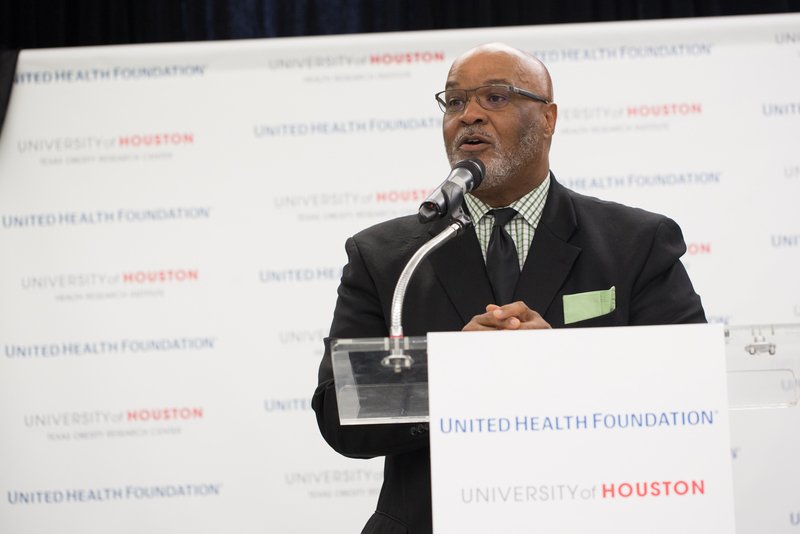 The United Health Foundation has awarded the University of Houston a $2 million grant to jumpstart a long-term, sustainable effort for preventing and treating obesity, type 2 diabetes and, eventually, other ailments faced by people in two of Houston’s underserved communities. The three-year grant to professors Ezemenari Obasi and Dan O’Connor, fellows at UH’s recently launched HEALTH Research Institute, will focus on the Third Ward in years one and two and will expand to the East End in year three, with additional funding possible if certain benchmarks are reached and improvements made. The goal is to reach more than 5,000 Third Ward residents. In response to the severity of the obesity epidemic and, thereby, rise in type 2 diabetes in the Houston metropolitan area, the UHF grant will support a scalable and sustainable prevention and treatment effort by bringing together an integrated network of partners and resources. This integrated consortium will involve UH researchers, community-based and faith-based organizations, schools and other educational groups, primary care clinics, local businesses, governmental entities, and both public and private funders. In the first two years, Obasi and O’Connor will evaluate the effectiveness of this integrated approach, which is consistent with the projected future U.S. health care model and will provide evidence to validate the program’s effectiveness, such as an improvement of health in participants. In the third year, the researchers will replicate and expand the community coalition and interventions into Houston’s underserved East End population to demonstrate scalability of the overall program. The ultimate objective is to create a model that can be duplicated and sustained not only in communities across the greater Houston area, but also throughout Texas and the United States. Another key component in making this effort live beyond the three years of the grant is to provide grassroots leaders and organizations in the community tools they can use, themselves, to empower them to better serve their health needs and be part of their own betterment. Once implemented and functioning, this extensive network will yield culturally-informed and community-embedded solutions that will be more likely to move the needle when it comes to improving public health in these areas and, ultimately, similar areas around the country. An additional strategy to sustain the success and progress of this initiative in years to come will be to train individuals within the community as volunteer paraprofessionals to recognize signs of distress in their neighbors as a first line of defense, giving them the ability to intervene and get them help more quickly. This will help expand the capacity to monitor, deliver and disseminate all prevention and treatment programming to support sustainability beyond the grant funding period. While the United Health Foundation grant will focus on obesity and type 2 diabetes, community members suffering from other ailments will be provided with referrals to other services within the extensive network that is being built. In conversations with community stakeholders, mental health emerged as one of the most critical issues people want to see addressed. Obasi noted that HIV and AIDS, which are already being addressed through existing partnerships UH has with organizations in its surrounding communities, is another key area of focus.